As the weather is turning colder, I’m thinking of comfort food. It’s been getting so cold here in Stockton, California that we are turning on the heaters and my cat wants to sleep under the covers with me every night. 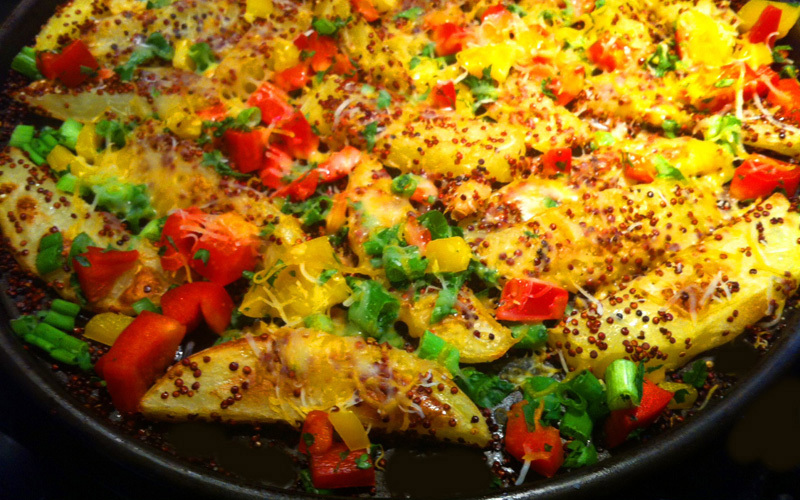 Here’s a variation on a plate of nachos, but with quinoa and potatoes instead of tortilla chips. It’s a colorful melange of potatoes, bell peppers, cheese and scallions — a virtual fiesta for the eyes and feast for the palate. Quinoa is actually edible seeds. I try to incorporate it into my cooking because quinoa is packed with protein, calcium, phosphorus and iron, as well as essential amino acids. In addition, one humble potato gives us half our daily recommended allowance of Vitamin C and has more potassium than a banana. That’s why these nachos are almost guilt-free but not quite. The baked quinoa gives you a crunchy nutty taste. I made this on one of the round Teflon-coated rotating flat oven pans that came with my RV oven. You also need a pot to parboil the quinoa and the potatoes and a large strainer to drain them. As usual, most of the time is spent chopping up the vegetables in advance. The amazing Mark Bittman app “How to Cook Everything Vegetarian for iPhone” is the inspiration for this recipe. I knew that Nick and I would scarf this up fast, so I made a small tomato and cucumber salad with a light ranch dressing on the side. As expected, there were no leftovers! All we were missing was a game of the Seakhawks versus the 49ers! – 1 pound white potatoes (that’s about 2 large or 3 medium), cut into wedges – peel potato or just scrub the skin clean, cut each potato into 8 wedges. Put potatoes and peeled garlic cloves in a pot of water, large enough to cover them, and bring them to a boil. While this is happening, preheat your oven to 400 degrees. Lightly grease your oven pan with olive oil. (I have a Sharp Carousel RV convection oven and for just about everything I use the “pizza” setting, which heats top and bottom of the pan.) Get the pan nice and hot in the preheating oven. That way the potatoes and cheese won’t stick to a cold surface. Once the boiling starts, add the quinoa to the potato water and set your timer for 5 minutes. After five minutes immediately drain the potato-quinoa mix into a strainer. Put the hot potato mixture on the now-hot oven pan, add more salt and pepper, drizzle a little olive oil on top, mix around a little with a spatula to distribute the oil seasonings, and spread them out on the pan again. Do NOT overcrowd the pan. If you have extra potatoes that would need to seriously touch or rest on each other, remove them. Your remaining potatoes won’t brown properly if they are overcrowded. The heat must be able to circulate all around each one. Make a second batch if you have too many potatoes. Allow to roast at 400 degrees or at Pizza setting for about 15 minutes, then pull out and toss around again. Depending on the thickness of your potato wedges you may need to give the mix another 15 minutes until everything is golden brown, the potatoes are soft inside and crispy on the outside. Then pull the pan out one last time. Sprinkle with the fresh veg mixture of scallions, cherry tomatoes, bell peppers, and one or two shakes of the hot pepper flakes to taste. Top everything off with that shredded cheese and pop it back in the oven for another 10 minutes or until the cheese is all melted onto the potato mixture. Let cool for a minute or two, sprinkle with parsley. Serve with a fresh tomato and cuke salad on the side.